Apple CEO: Tax Reform ‘Enabled Most of This Job-Creating Plan’ to Invest in the U.S.
Apple CEO Tim Cook said Wednesday that the company’s newly announced investments came in part thanks to Republicans’ tax reform law. Cook said Apple’s efforts on this front were "in the works" before the law was passed, but he credited the new tax code with enabling it, CNBC’s Jim Cramer reported. One aspect of Republicans' tax reform allows companies to repatriate overseas capital back to the United States, creating new economic activity. "While some of these efforts were indeed in the works, Washington enabled most of this job-creating plan to occur by changing the tax code to allow companies to return capital to all stakeholders," Cook told Cramer Wednesday. Cramer also related Cook's argument that Apple’s investments would have a large effect on the economy. "[Cook] said, ‘Look the people very much want to participate in the upside of the company and this is a longer-term way than a one-time cash bonus,’" Cramer said. The new repatriation tax rate is 15.5 percent under the new tax code, meaning that Apple is paying about $38 billion to bring about $245 billion back to the U.S. The one-time repatriation tax allows companies to free up cash previously held overseas. Apple announced Wednesday that its investment in the American economy would be more than $350 billion over the next five years. 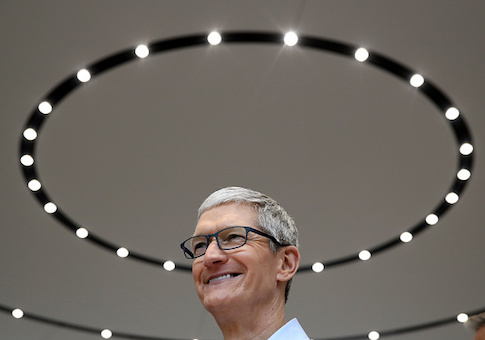 "Combining new investments and Apple’s current pace of spending with domestic suppliers and manufacturers — an estimated $55 billion for 2018 — Apple’s direct contribution to the U.S. economy will be more than $350 billion over the next five years, not including Apple’s ongoing tax payments, the tax revenues generated from employees’ wages and the sale of Apple products," the company said in a statement. Cramer also said Apple’s private investment will do more to create wealth and job opportunities than a government program. "Frankly, I think Apple's view of how to generate jobs, how to create wealth away from the shareholder base, is probably a heck of a lot better than anything the government could ever do," Cramer said. This entry was posted in Issues and tagged Apple, Tax Reform, Tim Cook, Trump Administration. Bookmark the permalink.